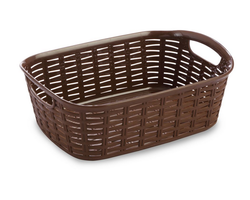 Round sack ceramic basket - brown, Sacks have never been as chic as this one made of ceramic in a rustic shade of brown . 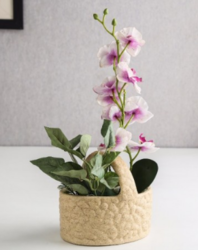 Ceramics Basket is designed and handcrafted by our efficient craftsmen. An enticing range of Ceramics Basket is efficiently fabricated using low-fire ceramics technique and a non-toxic glaze. These ceramics basket is a perfect blend of functionality and aesthetics. Black and white ceramic piece in the shape of a basket. Use it as a vase or just as is. - Send this gift basket, colourful 2 inch deep, engraved with fruit prints and round handle to your dear ones.